Morufat Balogun is Tissue Culture Specialist of the Yam Improvement for Income and Food Security in West Africa (YIIFSWA) project based in Ibadan, Nigeria, working on the development of technologies for high ratio propagation of high quality breeder and foundation seed yam. She has a Bachelor of Technology, Pure & Applied Biology, from Ladoke Akintola University if Technology (LAUTECH, 1996), MSc in Crop Protection and Environmental Biology (Genetics), University of Ibadan (1999), and a PhD, Plant Genetics, University of Ibadan (2005). 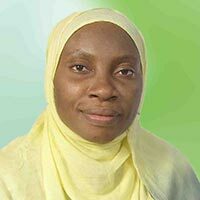 She is a senior lecturer (geneticist) at the University of Ibadan, since 2009 and visiting scientist at IITA since 2012. She had also served as a fellow for the United Nations University/Institute for Natural Resources in Africa (2000); IITA, Ibadan, Nigeria (2000-2005); Norman E. Borlaug International Science and Technology Fellowship for Women in Science, United States Department of Agriculture (2005). She is currently mentoring PhD, MSc, and BSc students and a mentor under the African Women in Agricultural Research and Development Programme. She is a member of the Genetics Society of Nigeria and the Society for In vitro Biology and also won grants from the State department, USAID, USDA, and the MacArthur Foundation.